Hyundai Motor Company, the largest automaker of South Korea, today revealed its all-new Sonata, a sophisticated evolution of the brand’s long-established midsize sedan. It symbolizes the practical application of premium Hyundai Motor technologies first launched in the all-new Genesis, which was given its world premiere in Korea last year. A modern, enhanced vehicle with best-in class advanced features, the all-new Hyundai Sonata has been designed and engineered using the company’s evolved Fluidic Sculpture philosophy. Displaying a premium, refined style, the new Sonata showcases Hyundai Motor’s intuitive interior and sleek exterior design ethos, projecting an athletic and harmonious appearance. The design concept of Hyundai Sonata focuses on ‘Inner Force’, a theme which points to its evolved confident and aesthetic design. Premium style, status and equipment deliver a feeling typically associated with cars in the segment above. It successfully fulfils the practical needs of drivers, while evoking a sense of class and confidence and symbolizes the democratization of new technologies first developed for inclusion in the all-new Genesis, offering Modern Premium values to more customers. Choong Ho Kim, Chief Executive Officer and President of Hyundai Motor, said during the all-new Sonata launching ceremony in Seoul today, the Hyundai Sonata has been playing a key role in the company’s rapid growth in the international market, as well as leading the development of Korean automotive industry. We are confident that the Sonata will change the landscape of the global midsize sedan market. “Hyundai Motor has been pursuing qualitative growth, providing innovative values and experiences to our customers, and the all-new Sonata will be at the centre of these efforts. The Hyundai Sonata project began with the aim of producing a world-class premium midsize sedan through innovation in fundamental areas, while maintaining its heritage. Inspiring driver confidence was an important goal for the model: it uses a modified Hyundai Motor platform, which has been optimized for providing a dynamic driving experience. The vehicle’s newly designed underpinnings contribute to an improvement in suspension performance and a greater structural rigidity over its predecessor, resulting in 41% greater torsional strength and 35% greater bending strength than the outgoing model. The new model is 35 millimeters longer and 30 millimeters wider than the previous generation Sonata, delivering a marginal increase in exterior size but worthwhile gains in internal volume. Advanced suspension design and active safety features including Lane Departure Warning System, Advanced Smart Cruise Control and Blind Spot Detection, ensure a safe and rewarding driving experience. Uncompromised levels of convenience features are fitted to the new Hyundai Sonata, providing it with the type of safety, technology and luxury equipment typically associated with vehicles from the segment above. A variety of premium features such as rear heated leather seats; rear side curtain airbags and parking sensors highlight Hyundai Motor’s commitment to delivering value beyond expectations. Next generation infotainment equipment and advanced multimedia systems are also fitted to the all-new Sonata. The engineers of Hyundai Motor Company focused on providing effective and efficient engines, which would deliver maximum performance for the new Sonata. As a result the new model provides drivers impressive fuel economy and acceleration, together with useable mid and low range torque that provides outstanding drivability in every condition. The wide range of engines is mated to automatic and manual transmissions, and all drivetrain options provide low exhaust emissions and high fuel efficiency, reemphasizing Hyundai Motor’s continuing commitment to the global environment. Since the Sonata badge was first introduced by Hyundai Motor in 1985, cumulative sales have almost reached seven million units, making this model the third Hyundai Motor model ever to achieve that landmark figure. Hyundai Motor’s previous generation Sonata was launched in 2009, embracing the brand’s Fluidic Sculpture design philosophy. The striking design and stylish appearance of the previous generation Sonata enhanced Hyundai Motor’s image. 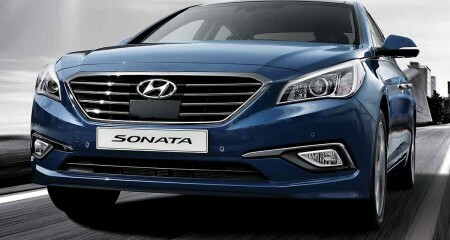 The all-new Sonata, the result of three years of development and an investment of approximately 450 billion Won ($460 million Australian dollars), is scheduled to be introduced outside Korea in the second half of 2014. The automaker targets selling a total of 228,000 units (Overseas: 165,000 and Korea: 63,000) this year, while aiming to expand up to 338,000 units (Overseas: 249,000 and Korea: 89,000) in 2015.